Giggle`spushchair can berear orforward facing for little one to enjoy the view. 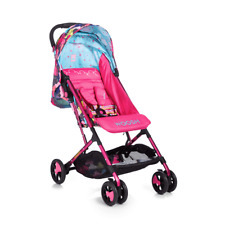 Your Giggle 2 also features a hood withSPF50 sun protection, lockable swivel front wheels withall-round suspension, spacious storage basket andbumper bar with removable padded cover all adding to its many charms. Good clean used condition. Comes with matching changing bag, footmuff, rain cover, strap protectors and newborn head hugger. Cosatto Woosh Stroller. The original Cosatto raincover. Compact and coordinating. Woosh is full of climate science with luxury tech fabrics. Woosh is the compact from-birth pushchair with big solutions. The original Cosatto raincover with soft carry tube. Just when you thought Cosatto's modern classic couldn't get any better. Well-bred Yo 2 has got the moves for any adventure. All adjustable and considerate, with a comfy wide seat, luxury foot rest and removable padded bumper bar - this is one pampering posh chair for babies who know what's what. In addition to this, the Woosh includes the original Cosatto Raincover, quick release wheels, under seat storage and an extra large under seat storage basket for all of your essentials. The Cosatto Woosh Stroller is a small compact bundle with tons of HUGE features. Cosatto`s Ooba 3-in-1 travel system performs a number of functions: pram, pushchair and infant carrier. Ooba 3-in-1 (Proper Poppy) byCosatto is alightweight, compact travel system that isversatile ,stylish and functional. TheCosatto Woosh is the compact from-birth pushchair with big solutions. With lockable front-swivel wheels and all-round suspension, nothing's getting in Woosh's way. Hands full?. Fold Woosh with one hand into a small compact bundle. Your A-list stroller and any-weather hero just got even tougher and rocks a stack of new features. The Cosatto Yo 2 is a handy, compact folding stroller to ensure you are hassle free when you are out and about. The Cosatto YO! Pushchair is a super lightweight pushchair with an aluminium chassis and features a convenient carry handle to make carrying the Yo that little bit easier.Folding the Cosatto Yo in is simple with its compact umbrella fold plus an auto lock to keep the pushchair together. Cosatto Supa Go The Streamlined Pushchair From birth Onehanded recline Adjustable leg rest Adjustable handle height Extendable hood. The streamlined pushchair when you"ve got places to go, fast - supa go brings streamlined solutions. The stroller closed is left standing alone. Cosatto Stroller Features Supa. Cosatto Stroller Size Supa. Size Closed: 104h x 27 x 35 cm. Size Open: 110h x 50 x 74 cm. Rain cover included. Fleece pillowcase reversible with double fantasy.